Canadian Country Woman: When should I pick all my tomatoes? When should I pick all my tomatoes? 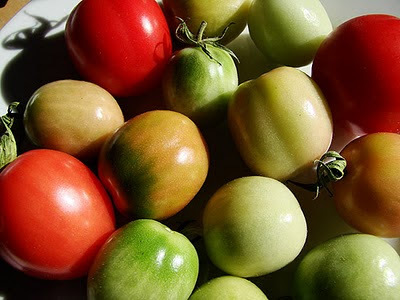 As the summer draws to a close, one of the most common questions that I hear is, "When should I pick all my tomatoes?" Tomatoes definitely love warm weather, and don't like frost in the least. So the time to pick all tomatoes is before the first frost. Yes, you can try and cover the plants to extend the growing season - especially if they are in a warm location such as the corner of the house, and you are expecting a couple more weeks of continued warm weather. Blankets, bed sheets, plastic, and tarps all work - as long as you remember to tuck the fabric into the soil at the bottom so the cold air doesn't get in. You can also use one of the tomato covers currently sold at gardening shops. But if you want to be sure your tomatoes are safe, simply pick them. They will ripen on your kitchen counter. If you have large quantities of tomatoes, place them in layers in a cardboard box. Put some newspaper into the bottom of the box. Place your first layer of tomatoes on it. Do keep them separate so they aren't touching each other. That way if one goes bad it doesn't affect the rest of them. Keep layering to a maximum depth of 3 layers. You don't want it too deep as it makes it difficult to check how the tomatoes are ripening. Place the box in a cool, dry place and be sure to check the tomatoes at regular intervals. I must admit that in the past I have forgotten to check regularly and found that all of a sudden I needed to make a huge pot of spaghetti sauce - NOW. If that should happen to you, there are lots free online tomato recipes, as well as tasty tomato cookbooks on All Tomato.com .